For whatever reason, one challenge we faced in plumeria propogation was finding a reliable rooting method. We’ve tried just about everything and our success ratio was pathetic, well under 50%. We think a lot of it has to do with our hot, arid microclimate, but I’m sure there was also operator error involved.Then I was introduced to bag rooting and have achieved success well beyond my imagination. I’m now successfully rooting well more than 90% of my cuttings. DISCLAIMER: There are many ways to bag root. People much smarter than I do it many different ways. I’ve tried many of those ways–some worked okay and some not. I’m not saying my way is the only correct way; only that it’s worked best for me. You’ll need to test it for yourself. Works great with typically hard-to-root cuttings, such as thin cuttings, short, broken tips, and Singapores. Takes up much less space than pots. It’s really easy and fast to bag cuttings. See exactly when a cutting has rooted. Conventional wisdom for potted cuttings is to wait until you have 1″-2″ leaves before you start watering. However, the vast majority of my cuttings root long before showing any leaves whatsoever. Start watering and feeding the plumeria earlier than if I used a method that doesn’t allow me to see the roots. All that to say that there are many factors in rooting plumeria: Age and condition of the cutting, vitality of the mother plant, variety, etc. I’m not sure there are any scientific studies to prove which method is fastest, because of all these variables. I’m looking more for reliability/success than speed, and that’s what bag rooting has delivered. What has worked best for me is coir and pumice. I’ve tested it against the other mediums and it’s is faster and the most consistent. Plus I believe the quality of roots is better. When unbagging, it doesn’t crumble as easily as the others. TIP: You can add liquid rooting hormone to the water you use to soak the coir. Once you see a good amount of roots, then it’s time to unbag and pot the rooting. Don’t rush when you see the first sight of a root. Give it time to establish more roots, then pot it up. All of my bag rootings have been in a greenhouse or on heating mats. For me, this has been about maintaining optimum rooting temps, and about extending the rooting season. But there are many folks who don’t do that. They need heat, but not direct sunlight. I tried rooting in multiple environments (greenhouse, heating mat, outside, garage) and all the cuttings rooted just fine. The heating mat cuttings rooted first, then the greenhouse, then the outside cuttings. I’ve also spoken to people who have placed them in totally dark garages, in attics, laundry rooms, and offices. One of the keys to success in bag rooting is a barely damp rooting medium. (If you have a moisture meter – available at most nurseries – you want the medium at around 20-25% moist.) One of the other advantages of coir is that you can easily see when it dries out. It turns a light red-tan color. If you have any type of heat on the bag, it will eventually dry out. To rehydrate I use a simple turkey syringe (example) you can get at most grocery stores inexpensively. I fill it with water and inject about half of the contents into each dried-out bag. TIP: You can add liquid rooting hormone to the water. 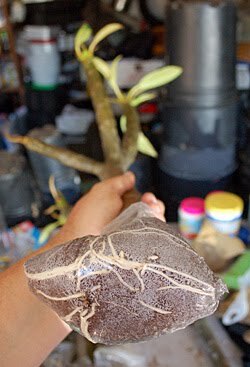 Additional note: Another use for bag rooting is in shipping cuttings. Bag rooting them before shipping will help to keep them hydrated during the shipping process. 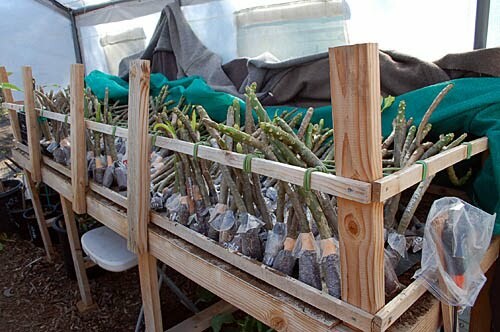 Rooting table: I fit up to 400 cuttings in a space that would only take less than 75 one-gallon pots.